Calvary provides one of the New York metropolitan area’s most comprehensive bereavement support programs. CalvaryCareSM continues after a loved one has died – through our robust bereavement support programs, which began more than 35 years ago. Today, Calvary provides one of the New York metropolitan area’s most comprehensive bereavement support programs. All bereavement support is provided free of charge as part of Calvary’s core mission of compassion and non-abandonment. Bereavement support is not reimbursed by private or government insurance. Thanks to the support of generous donors, we are able to provide these vital programs. Calvary provides bereavement services for adults, teens, tweens, and young children. 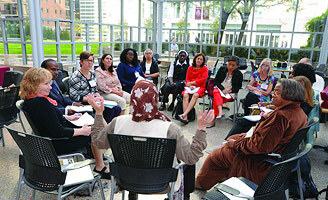 Masters-prepared counselors facilitate bereavement groups in the Bronx, Brooklyn, and Manhattan. Groups for adults are organized by participants’ type of loss (young spouse/partner, elderly spouse/partner, sibling, etc.). This ensures that people can share common perspectives in a safe space. We also offer several adult groups sensitive to the unique needs of grievers i.e. young adults ages 18-25, men-only and Spanish speaking. Groups for children (Precious Moments, ages 6 to 9; Tween, ages 10-12; and Teen, ages 13-17) use age-appropriate activities, such as arts and crafts, puppet-play, and journal-writing to encourage discussion and sharing. All children and teens who participate in a group are invited to attend Calvary’s week-long bereavement camp, Calvary’s Camp Compass®. The goal of all groups, whether for adults or children and teens, is to help participants express the full range of their emotions in a safe, non-judgmental environment. Anyone who is interested in participating must schedule a meeting with one of our bereavement counselors before attending their first session. (718) 518-2173, or (718) 518-2125. A connection to Calvary is not necessary to participate in any Calvary support group. All groups are offered at no charge. To attend any of the groups, prospective participants must first meet with one of the group facilitators before attending their first session.